Eezham Tamil land-owners in four interior GS divisions in Kiraan and Chengkaladi divisions of Batticaloa district are facing an imminent threat of losing upto 90 per cent of their paddy lands and 99 per cent of other lands which they owned for decades. Their areas are being absorbed into the Mahaweli colonisation programme under cover of ‘development’, say Tamil farmers. Agrarian Services Centre official at Kiraan T. Jeyaraj has informed the farmers that they would be only allowed to retain 2.5 acres of paddy lands and 0.5 acres of lands for homestead per adult person in their families as their lands were being taken over by the Mahaweli authority, the farmers said. The farmers who had the right to own maximum 25 acres of agricultural lands per person according to the ceiling introduced by the Land Reform Law in 1972 are now being told that the ownership of agricultural lands could not exceed 2.5 acres per owner. Similarly, the ceiling was 50 acres per person where the property did not consist exclusively of paddy land. They will only be able to retain 0.5 acres of lands per person av 18 years old, the agrarian official has informed the farmers. The move targets the villages of Mu'ruth-thaanai, Kudumpi-malai and Pearillaa-ve'li in Koa'ra'laip-pattu South (Kiraan), and Oamadiyaa-madu in Koa'ra'laip-pattu North (Vaakarai). These were villages protected by the LTTE before 2007. 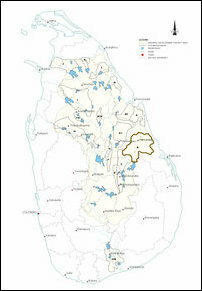 The vast area of System B (also known as Maduru Oya scheme) comes within the districts of Batticaloa (Eastern Province) and Polonnaruwa (the home district of SL President Maithiripala Sirisena in the North Central Province). Mr Maithiripala controls the Mahaweli ministry. 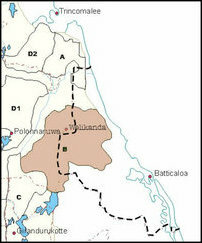 The SL State was scheming to settle 31,300 settler families from outside the districts of Polonnaruwa and Batticaloa in System B since the beginning. The right bank of the (Maduru Oya RB) is primarily Tamil. The late Gamini Dissanayake, who was one of the notorious SL ministers blamed for the burning of Jaffna Library in 1981, was attempting to launch a Sinhala colony in the lands of Tamils when he was the SL Minister in charge of Mahaweli development. However, the move didn't materialise as the LTTE began to establish de-facto control of the traditional homeland of the Eezham Tamils. In 2014, the Mahaweli Ministry and the Mahaweli authority launched a special project. Initially, the project was aiming to resettle Sinhala colonisers who had displaced due to the war along the border villages of Polonnaruwa. Later, the colonists started also to target the Tamil areas. The total command area of system B, as recorded in 2007, was at 16,866 hectares. This has been later increased to 19,216 hectares.